The I2CDIO24 is a programmable 24-channel digital input/output controlled designed for interface to 5V TTL/CMOS circuits. This device utilizes the MCP23008 and MCP23017 to control three 8-bit ports using I2C commands. Programmable GPIO is interfaced via 3 sets of screw terminals. Addressing of each port expander chip is set using jumpers. Up to 8 MCP23017 or MCP23008 chips may be attached to a single I2C port. This device counts as 2 devices on the I2C port. 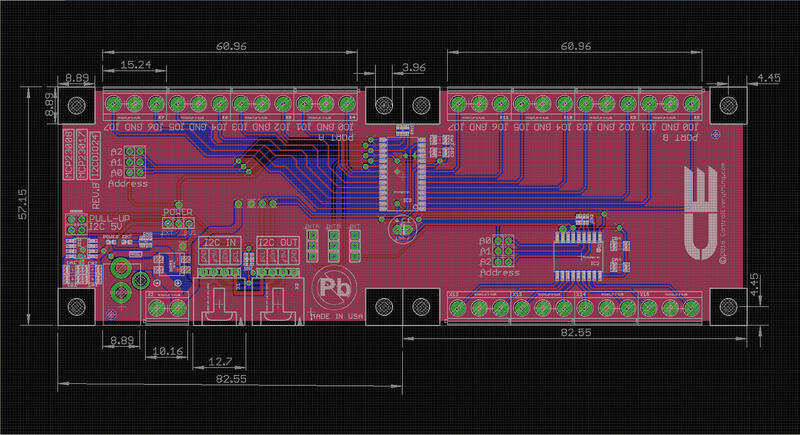 This controller may be powered by the I2C bus or from an external power supply.